Leaves are turning yellow and falling off. Leaves turn yellow and fall off when the soil of the plant is too wet. 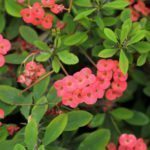 Move your Crown of Thorns Plant to a warm bright location with good air circulation. Allow the top half of the soil of your plant to dry out before you water again.